We already have Tutorial on Bootstrap Sign Up Form with jQuery Validation. 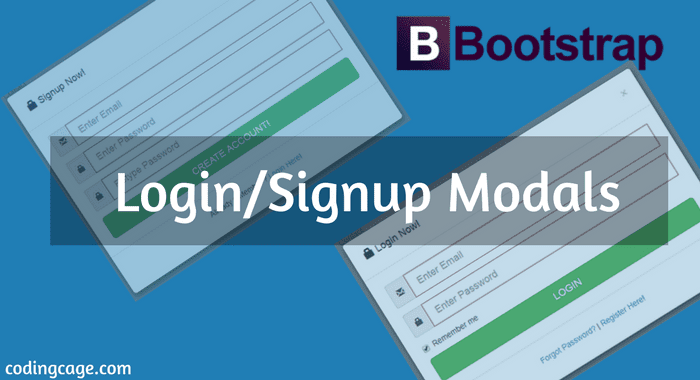 but here we will see creating forms on bootstrap modal along with validation. Well i have used here latest Bootstrap V 3.3.7 - Download it here. Or you can also use CDN if you don't want to download. Following is the HTML Page Structure, set up the necessary CSS and JS files as follow. As we all know that the bootstrap modal-content div contains modal-header, modal-body and modal-footer div's, this is the modal structure. This will be just above the JS Files as shown in the Page Structure. see below example. This is the Complete Page structure which requires to create Pop-up modals. Create Index.html page and add the following code inside it. So we have created a blank html markup now let's create Login, Signup and Forgot Password Modal Forms. the only one modal i have used over here with three <div class="modal-content"> the default content will be login content, here are those contents with different ID's. See the Following Example. In the above example the login modal content will be default and the rest two contents are hidden and will be shown by clicking on particular links given in all modal-footer, Hope you guys are getting. Till now we have seen the html markup's and structure, now let's have a look at the complete Modal which contains Login, Signup and Forgot Password modal-content div's. Now i hope you are not getting confused, this is simple and straight forward modal form, one modal with three different modal-content, that's it. All the modal-footer contain seperate links which triggers different modals[login/signup/forgot password], E.g Login footer has forgot password and signup links, Signup Footer has Login link, Forgot password footer has login link. We have done Designing part, now it's time of scripting, the jQuery Effects, take a look at this simple jQuery Code. These are simple jQuery FadeOut and FadeIn effects, which triggers on Footer Links Click, and accordingly forms are swapping. To use parsley form validation, just add parsley.min.js file with JS files at the bottom of page. and to trigger the validation add the single line of code in the jQuery Code. Already Given in the jQuery Code above. Here is the CSS code for all these modal design, Contains CSS code for Modals and Parsley validation. Done! That's it for the day, i hope you enjoyed and liked it. this is just designing part we have done here there are lot's more to cover which will see next time, the login, signup, forgot password process with jQuery Ajax, we will see this tutorial very soon. Can you create a tutorial about "create a blog using php and mysql"? Thanks for all the tutorials you have created. Nice...can't wait to get the continuation of this. Awesome tutorial as usual! You make it super easy to understand.